A new school for hearing impaired children is an immediate success and ignites the hopes of many for a bright future. The "Al-Hoda School" at Abbottabad was founded in May 1999 as a project of "The Hearing Impaired Education and Rehabilitation Association". Founders of this association and of the school were the Swiss parents of a profoundly deaf son. Both parents were born in Pakistan. When they experienced the wonderful educational results of a cochlear implant with which their hearing impaired son was provided two years ago in Switzerland, they decided to make a foundation for the promotion of hearing impaired children living in the District of Abbottabad in the North West Frontier Province of Pakistan. With the financial support from the mentioned foundation and with the help of several noble family members of this Swiss family in Pakistan, the "Al- Hoda School" was opened last September with about 20 hearing impaired children in an older residential building within a suburban area of Abbottabad. Now almost 30 children are attending the new school. The opening of this school deserves both recognition and admiration. Before its opening, hearing impaired children living in Abbottabad and its vicinity with a population of almost one million people received either no education at all or were obliged to receive their education via gestures and signs in two classrooms with 60 children in a government school for deaf children at Abbottabad. The "Al- Hoda School" has the aim to offer an oral education to its hearing impaired pupils. In order to reach the high goal of a good or at least a satisfactory oral education. It is, however, necessary to overcome as soon as possible the unavoidable initial shortcomings of such a courageous project. In order to point out these shortcomings and to set forth strategies to overcome them, Professor Emeritus Armin Löwe from the University of Education at Heidelberg, Germany was asked by the German Senior Expert Service to go once more as a volunteer to Pakistan and to support the efforts of the "Al- Hoda School" and its staff. Armin Löwe, 78 years old, is a retired professor of paedo-audiology and education of deaf children. He is also the author of about 25 professional books, some of them with four to six editions and with translations into seven languages. Prof. Löwe can also look back to almost 20 years of work in several South Asian countries (for example, the erection of the famous National Centre of Hearing and Speech for Children at Dhaka, Bangladesh, was proposed by him and realised in close co-operation with the German welfare organisation Andheri- Hilfe and the Bangla "Society for Assistance to Hearing Impaired Children -SAHIC"). In March and April 2000 Prof. Löwe spent one full month at Abbottabad. During his stay he introduced the teaching staff of the "Al-Hoda School" into the main principles of the maternal reflective method of teaching a mother-tongue to deaf children, developed by the famous Dutch Catholic Priest and teacher of deaf children Dr Antonius van Uden, and of the auditory-verbal approach. Before Prof. Löwe left Pakistan again (the stay at Abbottabad was already his 10th visit to Pakistan), he handed over to the members of the board of management and teaching staff of the "Al-Hoda School" recommendations for the future work of the school. These recommendations deal with the shortcomings identified by him within the teaching staff, the available (and not yet available) equipment, the school building, the admission of pupils, the differential diagnosis, the field of public relations, and the further training of the teaching staff. Owing to financial reasons, it will not be easy to realise all the recommendations given by Prof. Löwe in the near future. 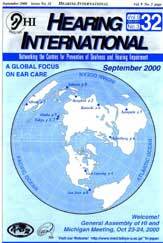 This applies especially for the urgent need for suitable hearing aids. Fortunately, there are some hopeful signs that the "Al-Hoda School" will have a promising future. Abbottabad, situated about 120 km north of Islamabad, the capital of Pakistan, is the seat of one of the finest hospitals to be found in Pakistan. The "Ayub Khan Hospital Complex" at Abbottabad with more than 1,000 beds and many sub-departments, and a "Medical School" for the training of medical doctors as well as several paramedical professional groups, is interested to co-operate with the "Al-Hoda School" and is considering to erect a child audiology centre. Thanks to the lectures offered to the staff of the ENT-department by Prof. Löwe, during the last week of his stay at Abbottabad three hearing impaired children younger than two years could be identified and included into the early home training program which the "Al-Hoda School" has started according to the recommendations of Prof. Löwe.